About 100 million Americans suffer from chronic pain, defined as pain that lasts longer than six months. Chronic pain can be mild or excruciating, episodic or continuous, merely inconvenient or totally incapacitating. With chronic pain, signals of pain remain active in the nervous system for months or even years. This can take both a physical and emotional toll on a person. For many people living with chronic pain, finding pain relief can be tough. A lot of trial and error is involved to find a pain treatment that works. Dry Needling, also known as myofascial trigger point dry needling, is a physical therapists’ advanced technique for trigger point release. Modern acupuncture notably includes both traditional and Western medical acupuncture, while dry needling is a division of western medical acupuncture. The goal of dry needling is to create a twitch response and depolarize the muscle membrane. During the treatment, needles are slowly inserted into the tight muscle, gently manipulated, and removed after a short period of time, and repeated in other muscles on different parts of the body if needed. While acupuncture is intended to target specific trigger points and stimulating nerve impulses with the use of filiform needles (acupuncture needles), dry needling is also used to treat disorders and pain, by stimulating a specific trigger point that may be causing pain to go to other parts of the body. 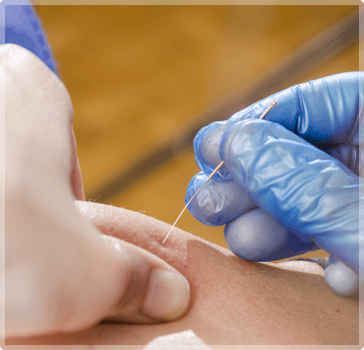 At Endeavor Physical Therapy, our physical therapists use a procedure known as dry needling to help treat patients release muscle tension and pain, with the use of acupuncture needles. This procedure treats those with sciatica, knee pain, rotator cuff syndrome, plantar fasciitis, and other muscle strains. To request your appointment for dry needling, call Endeavor Physical Therapy at (512) 284-7192 or request an appointment online.